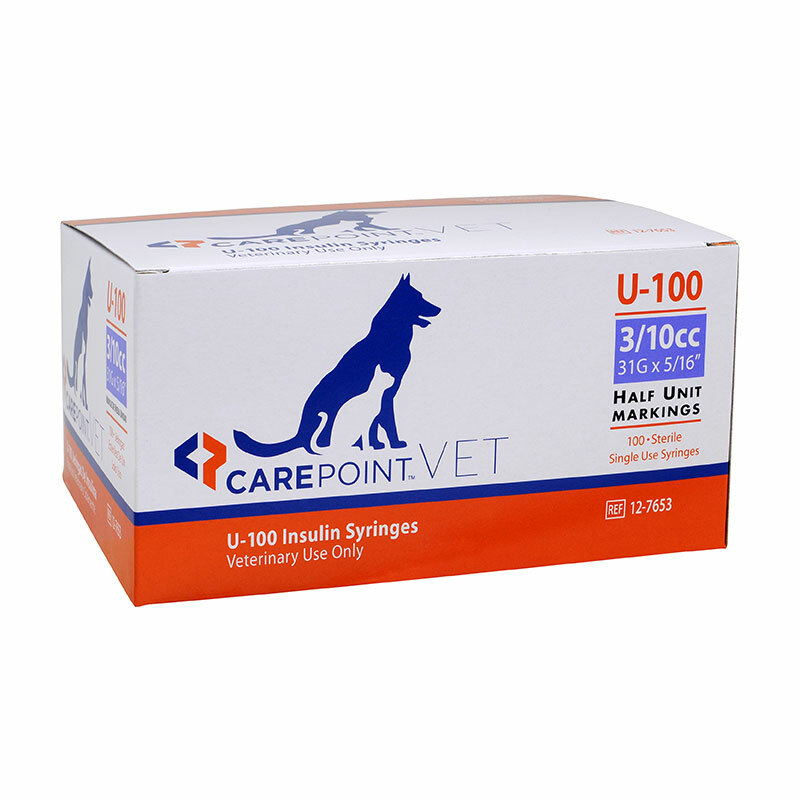 The CarePoint Vet U-100 Syringes 31G 3/10cc 5/16" With Half Unit Markings Box of 100, model #12-7653, has been specifically designed to assist you with your pet's diabetes care plan. The CarePoint Vet U-100 Pet 31G 3/10cc 5/16" With Half Unit Markings Box of 100 provides large, bold, easy-to-read permanent markings for accurate dosage and lubricated needles for injection comfort. For use with U-100 ONLY. Easy to use, nice packaging. Perfect syringes for my diabetic cat! Great price! These are very well made, very easy to see. Have units and Half unit marks. Works great for my cat. Best needles I have used for him in 4 years. The price is excellent but I give extremely low doses to a very small cat. I must try to estimate just one quarter unit. The half unit markings are critical to me, and they definitely help me, but the plunger seems loose, so I am less confident about my precision from dose to dose. (Don’t get me wrong; I do not expect a lot of precision when I am so close to zero. I just think I have used other brands that are better probably more consistent.) For larger doses than I give, I would be comfortable using these. Been using these for several years now and am highly satisfied with them. ADW's service and price is excellent and you can't beat how quick shipping is. The only thing that would make these better, is to have a slimmer syringe, so that the half marks are easier to see. This has been a lifesaver for me. My dog needed only 1/2 unit of insulin and this makes it so accurate without trying to guess.